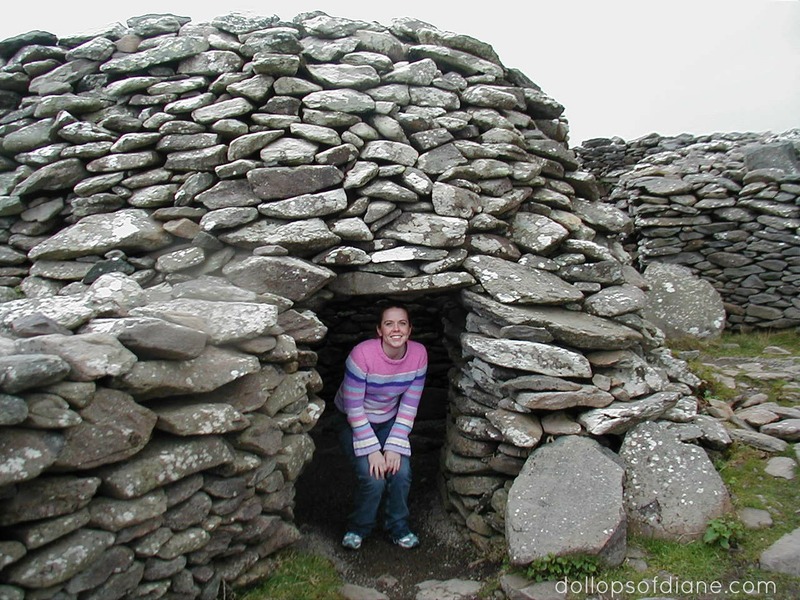 Dollops of Diane: Memories from my Trip to Ireland! Happy St. Patrick's Day! 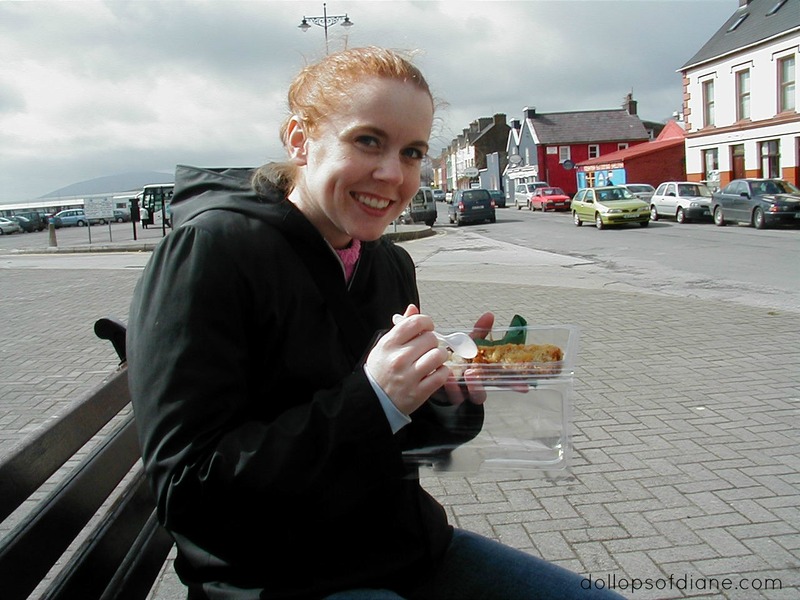 In honor of the holiday, I'm taking a trip down memory lane by reminiscing about my trip to Ireland in April 2004. My cousin, Janet, and I did our own self guided tour of the Emerald Isle for nine days. We started in Dublin and then went to Limerick, Dingle, Galway, and Ennis. I almost DIED the first time we went to eat and the restaurant didn't have any ketchup. Who knew ketchup wasn't a standard condiment in Ireland?? We then went to McDonald's and took ketchup packets so that I could carry them in my backpack for future use. Priorities, people. I made my poor cousin drive (in our tiny rental car) the entire time since I was afraid to drive on the "wrong" side of the road. One night she came down with horrible food poisoning and as she was vomiting all night I stayed awake worrying that I would need to drive the next day. Luckily, she pulled through and drove (she's good like that). Ireland is where my love of country music came from. When we went we had no idea that each county only had one radio station which was talk radio most of the time. My cousin had one mix CD that she had made in her luggage and we played it on repeat in the car. In the beginning I was making fun of all the songs and by the end of the trip (which included lots of time in the car!) I was belting out the tunes myself. It took us FOREVER to find the street that we would be staying on in Limerick. We drove around for what seemed like hours (it could have been) before we found it. We also learned that on Sundays everything is closed in Limerick. Perhaps, not the best day to go there! We saw sheep - lots of sheep. On every telephone pole/tree there was a sign advertising the Kerry Home and Motor Show. Literally, every single pole. In Galway, we stopped at the village of Claddagh. We thought it was super cool to buy Claddagh Rings in Claddagh itself. That ring was one of the items that was stolen when my house was broken in to and I never got it back. Sadness. It poured when we were in Ennis so we ended up going to the movies to see Under the Tuscan Sun. I can't even remember what the movie was about but I always remember that's what we saw. I also made Janet walk in the rain with me to find a store to buy soda. I need my soda. Dingle and The Cliffs of Moher were my favorite spots of the trip! 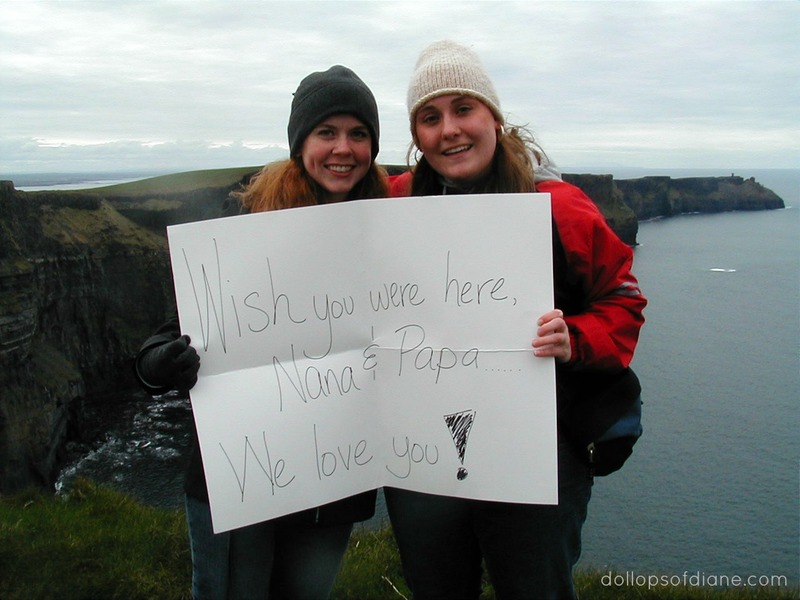 My cousin made this sign and we had our picture taken at the top of the Cliffs of Moher for our grandparents. Side note: We forgot the sign in the car and she had to walk halfway back down the hill to get it. She was not happy. This is me eating a Fried Snickers bar - yum!